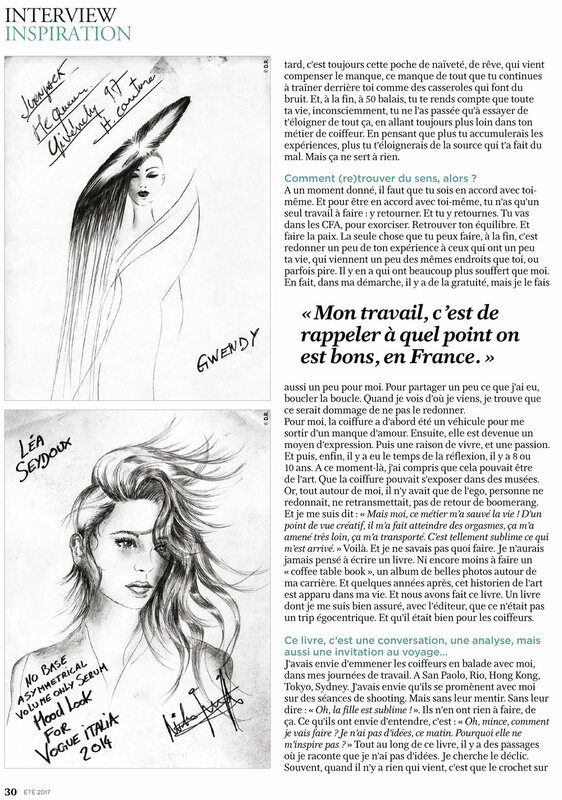 ECHOS coiffure n°72 France 2018 : Behind the scenes with Nicolas Jurnjack — En exclusivité, Nicolas Jurnjack, l’incontournable coiffeur studio et de défilé, nous ouvre son journal de bord et nous fait découvrir les dessous d’une prise de vue. Silence, on shoote ! 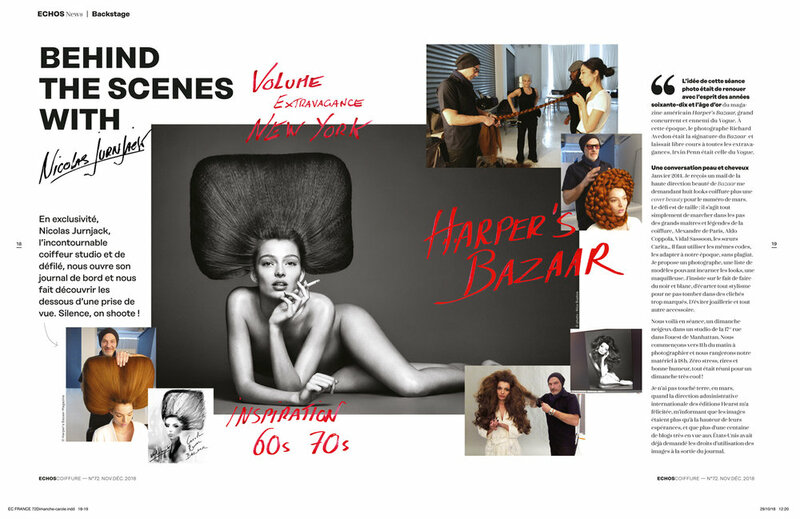 — L’idée de cette séance photo était de renouer avec l’esprit des années soixante-dix et l’âge d’or du magazine américain Harper’s Bazaar, grand concurrent et ennemi du Vogue. À cette époque, le photographe Richard Avedon était la signature du Bazaar et laissait libre cours à toutes les extravagances. Irvin Penn était celle du Vogue. Tush Magazine: Ost Frise - Nicolas Jurnjack Hair Story. Interview by Laura Dunklemann. Siehst du diese Sensibilität als dein Erfolgsgeheimnis an? Do you see your sensibility as the secret to your success? One can only speak of perfection when perfect technique and perfect sensibility become one. Perfection means having great technique but being unconscious of it and allowing oneself to be guided by a feeling. If you only have technique, you only prove one thing - you can do crazy stuff with hair. Aujourd’hui, Nicolas se démène pour créer une formation complémentaire à la coiffure, à l’exemple de ce qu’a fait Thierry Marx pour la cuisine. - Today, Nicolas is working towards creating a training course in hairdressing, following the example of what Thierry Marx did for cooking [offering theoretical and practical knowledge for real conditions.] Nicolas Jurnjack par Laure-Emmanuelle Bonilla. Razgovarao: Denis Pucelj . Intervju Nicolas Jurnjack. Denis Puceli interviews international fashion hairstylist Nicolas Jurnjack. Ovaj je intervju namijenjen svima vama koji želite više raditi u modi – nadamo se da će vas njegovi savjeti inspirirati kao što su i nas te da će vam pomoći na vašem karijernom putu. English translation:: This interview is intended for all of you who would like to work in the fashion industry - we hope that this will inspire you and help you on your career path. Intervju Nicolas Jurnjack: Radili ste s modnim dizajnerima kao što su John Galliano, Alexander McQueen i Jean Paul Gaultier. Kako je bilo surađivati s njima? Možete li objasniti svoj kreativni proces i kako se stvaraju frizure za modne revije? / You have worked with fashion designers such as John Galliano, Alexander McQueen and Jean Paul Gaultier. How was it to work with them? Can you explain your creative process and how the hairstyles for fashion shows are made? What kind of information can our readers find in your book? - I invite the reader to follow me behind the scenes of fashion on a journey of discovery and adventure. It's a reflection on hair and beauty, creativity and aspiration through the lens of my trajectory in the fashion industry, animated by anecdotes, ideas, memories, conversation, daily life and the people I meet along the way. The book discusses the history, politics and culture of style, hair, woman's aesthetics and the business of fashion, it talks about the importance of knowledge, education and imagination and never giving up on your dreams. Nicolas Jurnjack is a household name in the fashion and beauty industry. 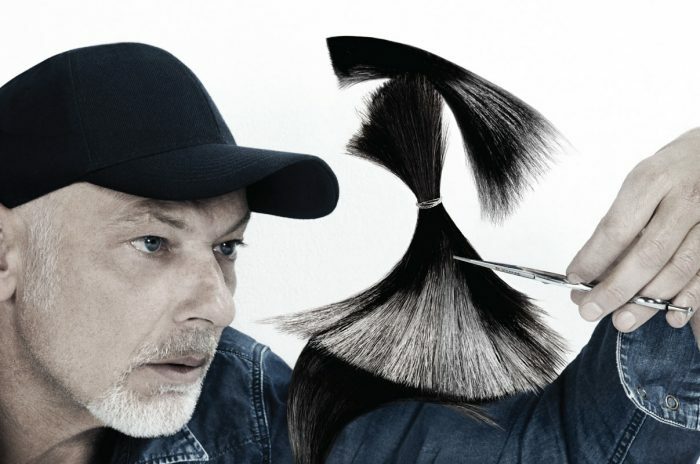 This year, the award-winning hairstylist released his first book In the Hair. Since Magazine. 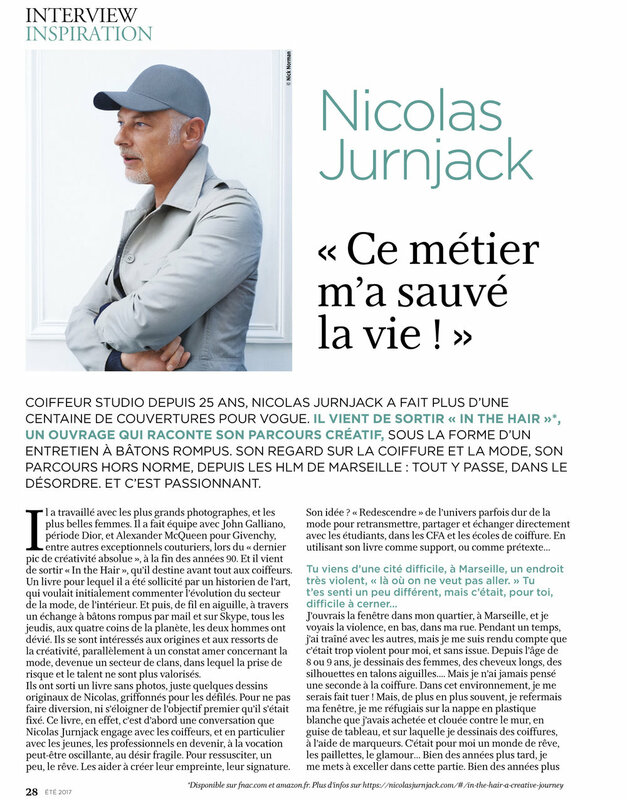 Interview with Nicolas Jurnjack. 07 - The Color Of Time. A celebration of the rainbow in hair colors and hairstyles. À la page d’un temps où l’industrie de la mode semblerait manquer de ton, Nicolas Jurnjack est le sculpteur des coupes colorées à l’encre des couvertures qui font fortes impressions. Après trente ans de conversation avec le cheveu, le coiffeur originaire de Marseille s’est décidé à en entamer une avec la publication. Un hommage sans image, premier du genre, il a publié « In the Hair » un livre dialogue partagé entre anecdotes et philosophie du métier. I am pleased to introduce to our Iles Formula Hair Talk segment, hair maestro Nicolas Jurnjack. Nicolas is by far one of the most exquisite hair technicians I have ever witnessed with hair. When I first arrived in Paris some 20 years ago I had the privilege to work alongside Nicolas on some of most prestige defiles, Dior, McQueen, Chanel, Galliano to name a few. His hair creations were written about for weeks after the defiles had passed. He is a maestro with hair, watching him work is hypnotic and stimulating and it’s evident that this French gentleman absolutely breathes hair. Do read his book that has just been released, inspiring in every way. Le Célèbre coiffeur marseillais, qui a l'habitude de faire couverture des plus grands magazines de mode (entre autres Vogue, Elle et Harper's Bazaar), débarque sur vos tables de chevets ! Dans son ouvrage intitulé In The Hair, Nicolas Jurnjack dévoile les dessous d'un métier plus complexe qu'il n'y paraît aux yeux de grand public. Faisant profiter de sa propre expérience, il expose ses rapports professionnel et intime aux cheveux et aux femmes. Un livre rendant hommage á cette manière noble qu/est le cheveu. Éditions Books on Demand. Prix : 21 euros. As a hairstylist in the fashion and beauty industry there is no “typical”. My time is divided into super busy stretches and relaxation time. The crazy, busy stretches are all airports and taxis. Hairstyling my way through different time zones, in studios, on a busy street, in beautiful parks, half way up a canyon, or surrounded by animals who would be more at home on an from African Savannah but are part of the shoot! Different models, teams, clients, stories and always different hairstyles. NJ: In 1994 I was selected to present six original hairstyles at the Louvre, which was going to be on display for two months. I was in my twenties at that time and it was a dream come true! I was so nervous and excited at the same time because it was bigger than anything I’d ever done before you know, like for magazines. The audience was going to be bigger and not just restricted to fashion aficionados. I started to panic. So I went to the Louvre and found myself wandering from gallery to gallery, waiting for inspiration to hit me. But somehow I couldn’t relax, the place was crowded and I still got nothing! I told myself to forget everything I’d learnt so far and start from scratch and create something memorable. And eureka! The word ‘organic’ dawned upon me. I decided to come up with a hairstyle made entirely out of paper. Which turned out to be quite challenging – the technique used would have to ensure that the hairstyle would come to life and not fall apart. Among the greatest French hairdressers there is a visionary with golden fingers. Easily one of the most influential in the beauty & hair industry Nicolas Jurnjack's career is one for the ages. Born in the South of France Nicolas initially got his start while in his teens as an apprentice before snagging a life changing opportunity in Elle France. Nicolas attention to detail and meticulous ways eventually landed hm gigs with some of the most iconic names and brands in fashion including Kate Moss, Cindy Crawford, Alexander McQueen, Marc Jacobs, Jeremy Scott and Kenzo, to name a few. With hundreds of international covers under his belt, a showing of his work at the Louvre to the most recent release of his new book In the HAIR you can't help but wonder what is next in the more than thirty year career Nicolas has built himself. His hands have touched the hair of A-list stars like Jennifer Lopez, Sienna Miller, Kristen Stewart and Fergie, and top models ranging from Kate Moss to Adriana Lima. His work has graced the covers of over 150 magazines and been seen in the advertising campaigns of brands such as Givenchy, Lancôme, Hugo Boss, Diesel and Sephora. Yet, despite an impressive resume of high-profile clients and jobs, hairstylist Nicolas Jurnjack has managed to fly somewhat under the radar. Qué hace: Es el mago de los cepillos, nadie peina como él. Hace del cabello una auténtica escultura. Cómo ha llegado hasta ahí: A los 16 años dejó el colegio sin ninguna vocación a la vista, empezó como aprendiz en una peluquería sintiendo cero atracción por esa profesión que le cambiaría la vida. Ocurrió estando un día en el salón que había cerca de la playa, en Marsella (Francia), cuando un equipo de una revista de moda entró en la peluquería pidiendo ayuda para una sesión de fotos en la que había faltado el peluquero. Se ofreció voluntario (con 16 años) y algo hizo clic en su cabeza: esto podía funcionar. Se mudó a París sin contactos ni planes. Se ofreció en mil agencias como ayudante y consiguió que una le representara. Hizo pequeños trabajos hasta que un día el destino quiso que Vogue, por cambio de calendario, se quedara sin sus peluqueros habituales. Alguien le llamó y el trabajo que hizoterminó siendo portada. Durante diez años estuvo practicando en su casa sin sentirse suficientemente preparado, pese a que no dejaba de trabajar en producciones y en desfiles. Su primer backstage fue en 1997, con Alexander McQueen. De ahí en adelante se sucedieron Givenchy, Galliano, Gaultier, Albaz, Ricci, Kenzo, Jeremy Scott y más. 30 años de profesión avalan su calidad, que se puede apreciar en las mejores revistas del mundo. Sus signos de identidad: Siempre busca sorprender y lo consigue. Usa diferentes materiales que mezcla en el pelo para conseguir efectos y volúmenes increíbles. Madera, pintura en spray, ramas, follaje, metal, papel, lana, no hay límites a su creatividad, de auténtico artesano. Un hito: Su trabajo ha sido muchas veces premiado y expuesto hasta en el Museo Louvre de París. What Nicolas Jurnjack does: He is the wizard of the brushes, nobody styles like him. He is an artist with hair. How he got there: At age 16 he left school with no vocation in sight and began working as an apprentice hairdresser, at first it held zero attraction for him, but it became a profession that would change his life. It happened one day in a salon near the beach in Marseilles, France, a fashion magazine team entered the hair salon asking for help on a photo shoot, the booked hairstylist had failed to show up. He volunteered (aged 16) and something clicked in his head: this could work. He moved to Paris without contacts or plans. He visited a thousand agencies and got one to represent him. He did little work until one day fate brought him Vogue, due to a shooting schedule change and none of the usual hairdressers were available. Someone called him and the work he did ended up being recognized. For ten years he was practicing at home without feeling sufficiently prepared, although he did not stop working in productions and at runway shows. His first big show was in 1997, with Alexander McQueen. Thereafter Givenchy, Galliano, Gaultier, Albaz, Ricci, Kenzo, Jeremy Scott and more followed. His 30 years in theprofession is an endorsement of the quality and level of his work, which can be seen in the best magazines in the world. His signature: There are no limits to his creativity, he is an authentic craftsman. He seeks to surprise and he achieves it. He sometimes uses different materials to to achieve incredible effects and volumes such as wood, spray paint, branches, foliage, metal, paper, wool. Milestones: His work has won many awards and was even exhibited at the Louvre Museum in Paris. Photographed by David Dunan, the editorial shines light on Maja Salamon and some excellent hair styling by Nicolas Jurnjack that ought to dizzy partisans and critics alike. Sheets of hair ironed impossibly thin stand in moments of suspended animation atop Maja’s head. Hair that is styled to resemble waves, ribbons, brush strokes, and more is complemented in kind by dramatic makeup by Ayami Nishimura.